This might sound like a must-have feature, but to be honest with you, our early beta testers couldn’t import their content by using an RSS feed. 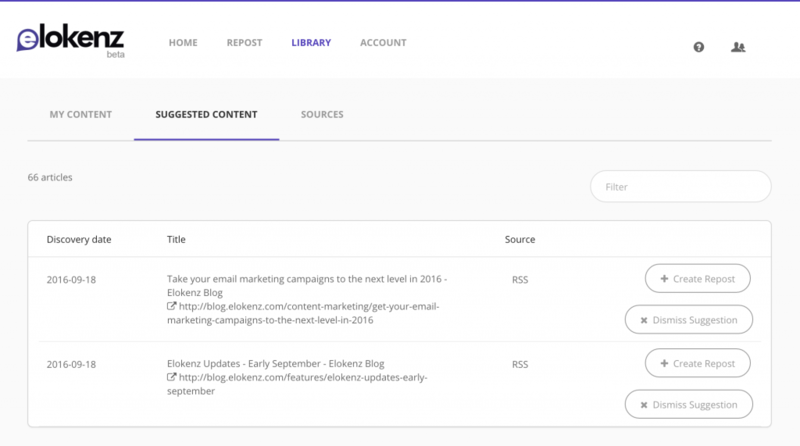 It is now possible to import your most recent content by using your blog feed. Let’s see how suggestion sources work. 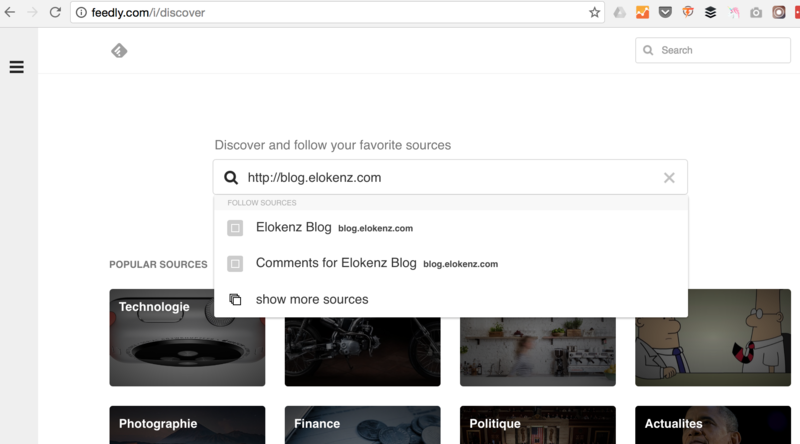 Elokenz will progressively support new source types, but at the moment, you can only import RSS feeds. So, the first step is to visit your website and find your RSS feed. Not every websites have an RSS feed, but if you have a CMS-based website (WordPress, Joomla, Drupal, …) you probably have one automatically. It used to be very easy to find one’s feed. Web browser used to display a small RSS icon in the URL address bar. However, it has disappeared. One quick solution to “discover” your feed, is to use feed readers to do it. One of the most famous is called Feedly (and it’s free). Once you are connected, you can visit the discovery page and enter the homepage from your site. It will fetch your page to extract all the available feeds. Be careful, sometimes blogs have several distinct feeds : content, categories, comments, … You should only pick the content RSS feed. So, you need to look for the text type=”application/rss+xml” which defines an RSS feed.the href attribute is the actual address. 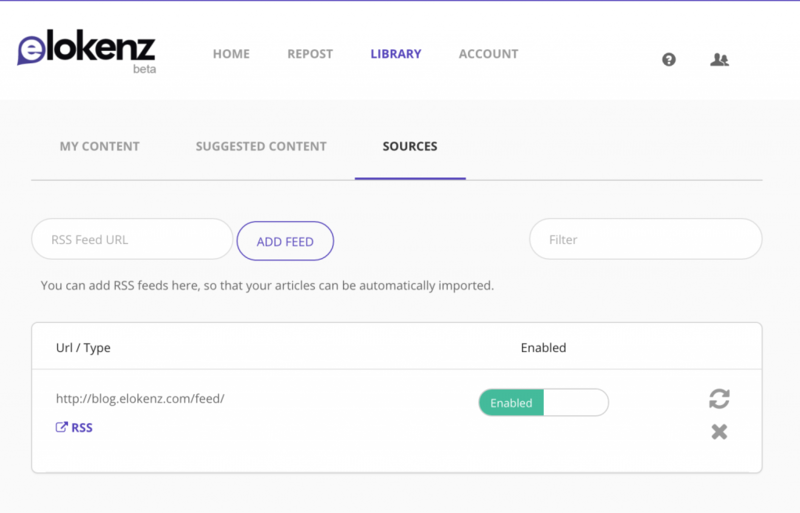 Now that you have found the feed of your articles, go to your Elokenz Library, and hit the “Sources” tab. Enter your feed url in the input section and click on “Add Feed“. Your feed will now appear in the sources list. Feeds are imported every couple hours. However, if you want to force the fetching process, you can click on the Rescan button. Your feed will be queued and fetched within minutes. After your Source is scanned, the articles that are not already in your Library will appear under the tab “Suggested Content“. If you just clicked on “Rescan Source“, you need to refresh your browser manually (hit F5) to see the new articles. 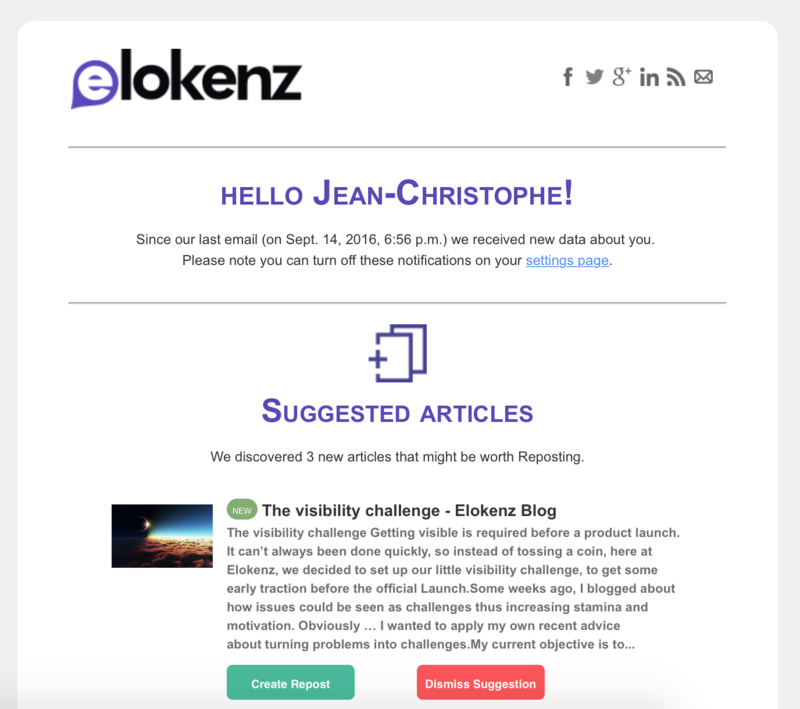 By default, Elokenz will send you a notification email with your new discovered content. As frequent notifications emails are really annoying, Elokenz is only sending an email if it detects a new content from your feed ; and if you publish more than once a day, it will never send more than one email daily. From this email you can directly add a content to your Library and Create a repost (the green button). You can also Dismiss a suggestion (so that it stops appearing in your suggested articles). So try it and let us know what kind of feed you’re adding to your account. Do you want another type of Source ? Let us know in the comment section.